Loraine Mottern is at it again. Every year about this time she distributes the annual geranium order form. She posts it in store windows and on the community bulletin boards at the Eastport Post Office and the Eastport Market. She sends persuasive press releases to all the newspapers. It has crossed my mind that if Loraine’s determination could be bottled and marketed . . . but I digress. 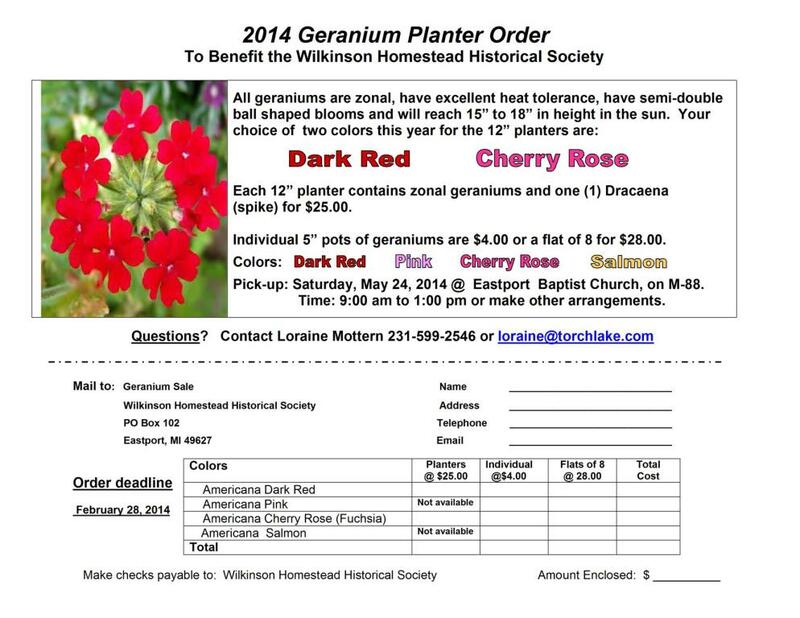 The geranium sale is a benefit for the Wilkinson Homestead Historical Society. “Well then what historical significance does it have?” she wanted to know. I suppose she wanted to hear that some famous person slept in the front bedroom or that some dramatic incident occurred in the kitchen. Nope. Not so far as I know anyway. But here’s the thing. 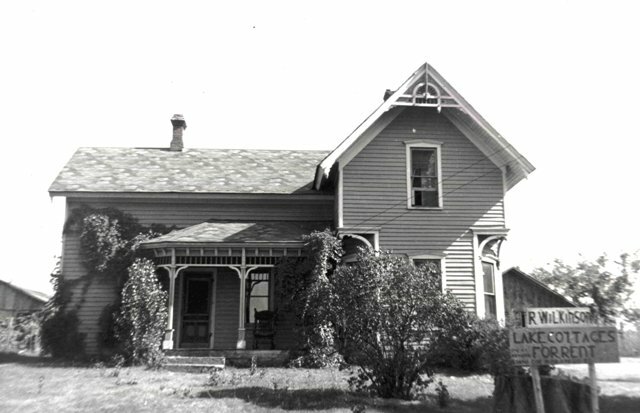 It was lived in for a good long time by Ray Wilkinson and his wife Hattie Cross Blakely Wilkinson, and between them they were connected to pretty much everything Around Here between 1880 and 1960. Back in the 1920s Ray and Hattie recorded a plat along the northeast shore of Torch Lake where they proposed to build rental cottages for the growing summer trade. I haven’t figured out whether they ever succeeded with their development, but Ray was definitely in the resort business one way or another. I will have a good time sorting it all out. Stay tuned. And please buy some geraniums. Your form is below. If you click on the image you will get a nice big picture of it, which you can use to order your very own planter or individual pots. Think of it – there will be a spring. There will be flowers. And there will be a Wilkinson house. Back in the early sixties, my Dad and I used to stop at a roadside stand at that location to enjoy a piece of homemade cherry pie… “Hattie’s Hut”… wonder if any of your other readers recall that small eatery? Hi Charley – We have photos of Hattie’s Hut in the Wilkinson collection. There were a lot of extraordinary Hatties in the Township over the years. Hattie Cross Blakely Wilkinson, Hattie Chamberlin Arnold, Hattie Skeels Arnold, Hattie Nicola Arnold–the Arnold men were partial to women named Hattie. The one who operated the beloved Hattie’s Hut (a/k/a Arnold’s Hamburgers) was Hattie Nicola Arnold. You’ve given me an excellent idea, though. In addition to geraniums, we should sell cherry pie by the slice. It would have to be very, very good cherry pie. Historic cherry pie. It is a pretty house. You should see it with the landscape in bloom. I like the idea of doing something because that is the sort of thing that you do. We in the Langholm Archive Group operate on much the same basis. Good luck with the sale of geraniums (geranii?). This is why I identify with the Langholm group. I must look into the plural for geranium. Oh, my! My mother’s mother was called Mabel, but her given name was Hattie Mabel Crowley. I’ve never known or even known of another Hattie. I can cross that one off my list. I remembered that post you linked to immediately. I went over and checked, and saw no evidence that I passed it on to Jeanie and her bicycle-riding-fanatic Rick. I’m going to do that. Plural: geraniums. If I were up there, I’d buy plural, in all colors. Hattie, it turns out, was a popular nickname for Harriet at the turn of the last century, but it was often the actual name, too, at least Around Here. I have grown very fond of my Hatties. It must be geraniums, of course, but wouldn’t it be fun if it were geranii . . .
You promise that spring is coming ? Honest ? Just because its inhabitants weren’t “famous” (define “famous”) doesn’t mean a surviving house from an earlier time should not be preserved. Such houses and the way of life they represent give a window into a past world that is growing farther and farther away, faster and faster every year. Today there is a whole generation who have grown up with the phrase “hang up the phone” who have never used a phone that had anything to hang up or hang it up on. The first powered flight was made in 1903. Men landed on the moon in 1969. That’s a time span of only 67 years, less than a person’s lifespan. The lifestyle of people in 1920, when only 1% of the nations homes had electricity or indoor plumbing, is so different from the way we live today that most people can’t even imagine it, never mind how people lived in the 1880’s. (That’s only three generations ago — my grandmother was born in 1886) Your historic house is just that: “historic” if for no other reason than that it preserves the evidence of a way of life that is so different from our own. And of course there’s always Locally Famous, and the ever-popular Infamous. I agree with you that it’s nice to have ordinary houses from other eras. One of my favorites was actually built in the 1940s, but it is a Sears kit house, beautifully done and meticulously maintained. I’ve thought of all kinds of stories to do about Antrim County houses, generally along the lines of the oldest ones, the ones with the most interesting stories attached . . . but it occurs to me that it might be nice to just ask people to tell me about the ones they love. That’s a beautiful house. We stayed in a lovely timber house of a similar age when we were in Oakhurst CA this summer – the Yosemite leg of the journey. (Did I tell you we came over to the US this summer? On a crazy 17 day road trip.) I couldn’t believe how well preserved all the wood in that house was. In our damp climate it really wouldn’t have lasted so long. We need stone and brick here, especially at the moment when half the country is under water. Good luck with such a worthy cause. You did not say that you were Over Here, rascal, or if you did I was off on a digression of one sort or another. But I forgive you. If I’d been planning a trip I’d have preferred a lovely timber house to a scruffy Writing Studio and Bait Shop myself. Frame houses were – and are – popular in Michigan because we have a long connection with logging. The materials to build a house were ready at hand in a sense. But we can have a lot of damp, too, so home maintenance is a constant battle. Water. Can’t live without it, can’t keep it from sneaking in where it’s not wanted. My siblings and I fondly remember going to Hattie’s Hut! What a treat for the 6 of us. One summer we had a bucket loaded with frogs from the lake. In the scurry to get out of the station wagon and over for a burger one of my brothers knocked the bucket over. When we came back to the car there were frogs hopping all over! My dad made us catch every last frog and drop them back into Torch. Those were the good ole days!